We’d love your help. Let us know what’s wrong with this preview of The Truthseeker by Heidi Catherine. Nax and Maari travel to the depths of the Can she learn to forgive before her time runs out again? Or will the truth destroy her? To ask other readers questions about The Truthseeker, please sign up. Another spellbinding tale by Heidi Catherine. I enjoyed The Soulweaver so much I was a bit worried this second instalment would have a hard job living up to it - but if anything it's better! This series just gets better and better. The Truthseeker sees the return of the Soulweavers, the Mother (although you might not recognise her), the Author and the new character the Truthseeker. Heidi Catherine's imagination holds no bounds in this book : the reader visits a planet far away where humans are evolving into fish; then the journey continues back to Earth to the slums of Mumbai, to London and back again. The author's sense of place is second to none - and I felt a connection to each s This series just gets better and better. The Truthseeker sees the return of the Soulweavers, the Mother (although you might not recognise her), the Author and the new character the Truthseeker. Heidi Catherine's imagination holds no bounds in this book : the reader visits a planet far away where humans are evolving into fish; then the journey continues back to Earth to the slums of Mumbai, to London and back again. The author's sense of place is second to none - and I felt a connection to each setting I found myself in - and she is skilled at character-building. The Truthseeker is a continuation of a love story started in The Soulweaver and the author weaves these two stories together seamlessly. Heidi Catherine paints such an eloquent picture of her two different worlds, I really felt like I was in middle of the slums in India with the two sisters as I read the book. The stunning twist when the true identity of the two sisters is revealed had me gasping and desperate to read on. Can’t wait to read the last of this romance trilogy. A poignant story that will tug at your heartstrings. A beautiful tale that flows beautifully, submerging you into a world of love, longing and heartbreak. Awakening concepts of eternal soulmates and far away worlds. A book to read with a tissue in your hand and smile in your heart. If you're needing a story that will not only make you tear up, but also stir love in your heart, look no further. The 2nd book in the series doesn't always live up to expectations, but Ms. Catherine hit a home run. A beautiful story of love between not only lovers, but siblings, parents and friends. This story captured my heart and left me, strangely, wanting more, but also contented with where it had ended. It left me feeling that love could conquer all, if only we allow it. I can't wait to read the third book of the Soul Weaver series. This one is my favorite of the series. I found it to be so moving. I was captivated. Very enjoyable reading with strong characters and vivid place settings. 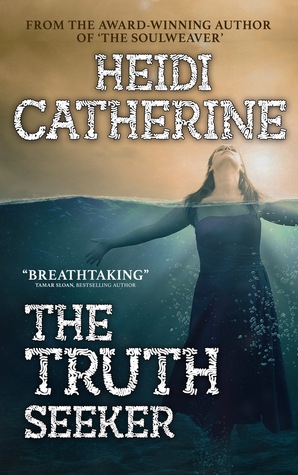 The Truthseeker is the second in Heidi Catherine’s The Soulweaver series and the second I’ve read. Heidi takes the concept of reincarnation to create a fascinating story about soulmates and love everlasting. She makes me a believer even when the action takes place on another planet. My favorite part of The Truthseeker is when her characters live in the slums of Mumbai. I put off all of the things I was supposed to do because I just could not stop reading. Onto the third book. I just love these books. I thought the first book in this series was amazing, but the second made me rush out and buy the third. Beautiful written, with dramatic settings and an intriguing storyline. I love the covers too. If you enjoy books about finding your soulmate and reads that are full of romance and intrigue, then these books are for you. She lives in Australia, not able to decide if she prefers Melbourne or the Mornington Peninsula, so shares her time between bot Heidi Catherine is an award-winning fantasy author and hopeless romantic.